Go where fish and birds are your only companions! When sight fishing from my 2007 Beavertail Skiff I am always pleased at the ability of this technical skiff to handle so many situations with ease. The B2 makes guiding and fishing fun. Two foot chop, she'll eat it. Poling silently in five inches of water towards a school with a cross breeze, piece of cake. Getting up close and personal on a flooded grass flat without shutting down every tailing fish within fifty feet, no problem. Running home in comfort and style while keeping us safe, all in a days work. A stable casting deck and generous cockpit the Beavertail B2 is outfitted with a jack plate, Power Pole, Garmin GPS, Yeti cooler and a 60 HP Evinrude the boat is not lacking for convenience while still having a bare bones attitude. 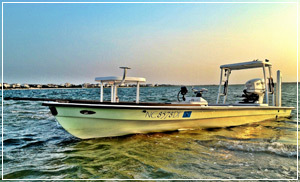 This boat was designed with two aspects in mind, comfort and fishability.